Farmer, municipal official, MLA (1888-1892), MLA (1900-1903), MLA (1903-1907). Born at St. Boniface on 29 April 1859, son of Elzear Lagimodiere and Sarah Goulet, grandson of Jean Baptiste Lagimodiere and Marie Anne Gaboury, he was educated at St. Boniface College. Appointed Secretary-Treasurer for the Rural Municipality of Tache in 1880, he took up farming in the Lorette area. 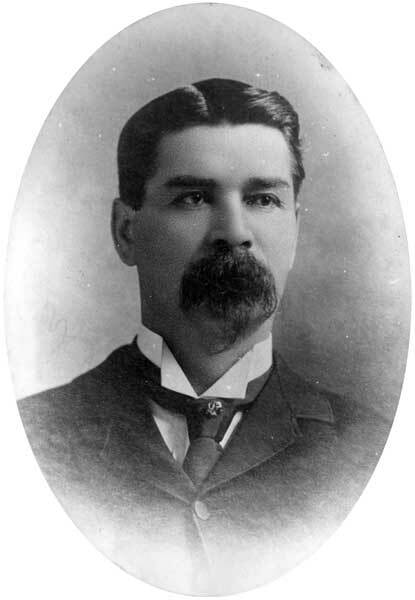 He was elected to the Manitoba Legislature in the 1888 general election, for the La Verendrye constituency, serving a single term until defeats in 1892 and 1896, then was elected in 1899 and 1903, defeated in 1907. In 1880, he married Lucie Alice Genthon (1863-1925) and they had ten children: Rodric William Edward Lagimodiere (1882-? ), Emma Sara Josephine Lagimodiere (1884-? ), Marie Rosalie Lagimodiere (1889-?, wife of Jean M. Poitras), Alfred Roger Leopold Lagimodiere (1891-? ), Juliette Ophilia Lagimodiere (1893-?, wife of Arthur Goulet), Joseph Leopold Romeo Lagimodiere (1896-? ), Marie Alma Virginie Lagimodiere (1897-? ), Victoire Marie Lagimodiere (1899-? ), Marie Josephine Lucie Lagimodiere (1902-? ), and Marie Anne Alice Lagimodiere (1905-?). He died suddenly at his home at Lorette on 20 October 1930 and was buried in the Lorette Cemetery. “Pioneer woman passes away,” Winnipeg Tribune, 1 June 1925, page 2. “W. Lagimodiere, pioneer here, dies suddenly,” Winnipeg Tribune, 21 October 1930, page 1. “Venerable son of Manitoba expires,” Manitoba Free Press, 22 October 1930, page 3. We thank Grant Anderson for providing additional information used here.